Ushuaia is as far south as south gets. The land of fire, tierra del fuego, is an large island at the tip of South America. The bottom of Patagonia, it’s a place where Antarctic winds blow daily and the weather changes in minutes. Ushuaia is a far as you can go before you reach Antarctica. 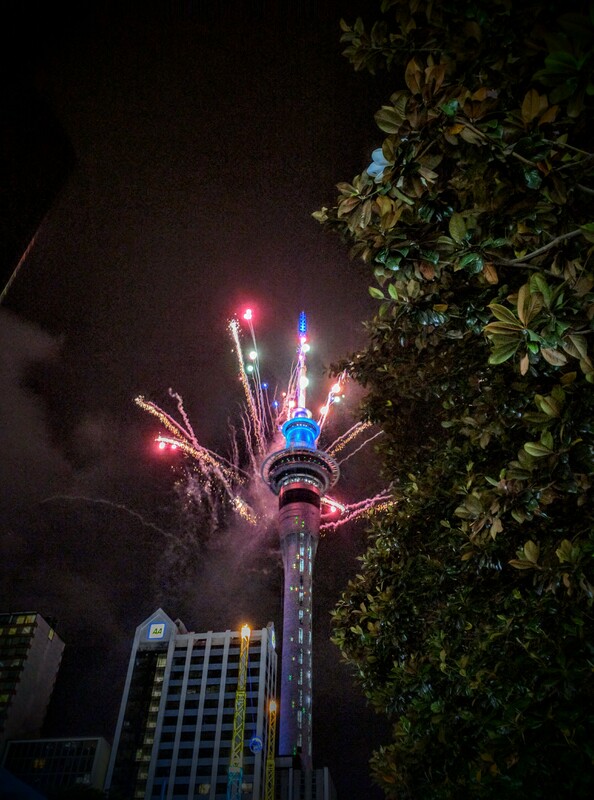 Leaving Hawaii, the easiest way to get to South America, is back through Auckland. Landing very late on Dec. 31st, we actually got to celebrate the Worlds first New Years, in New Zealand. After what was basically a long layover, we hopped on a flight to Buenos Aires, and then on to Ushuaia. Ushuaia is a strange place. An outpost, a link to the world beyond, for one of the most isolated regions in the world. 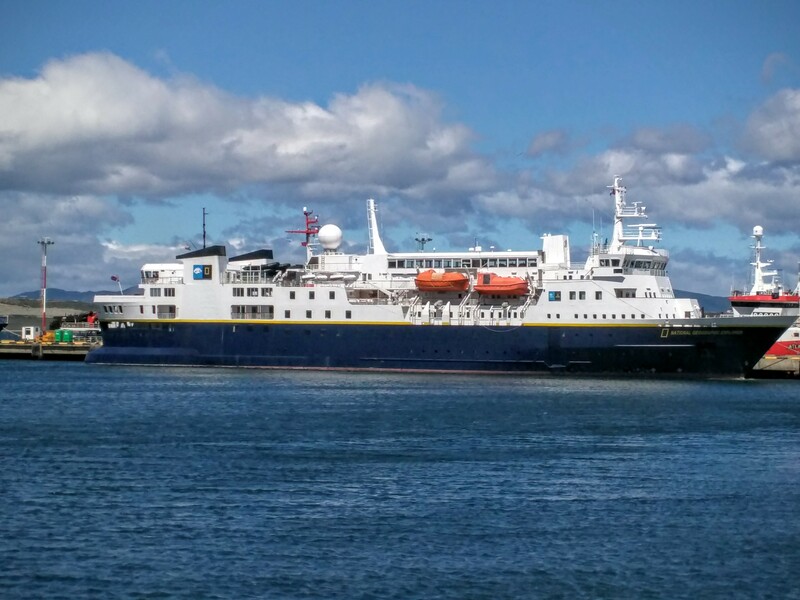 Ushuaia is normally just a transit point for people boarding ships to Antarctica, but for us it was a destination. 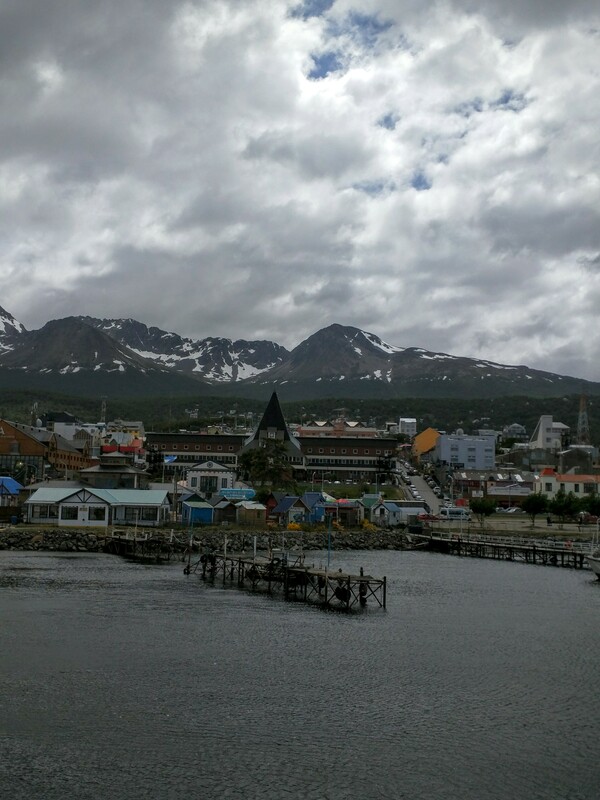 Ushuaia is cool, similar to coastal Alaska. A place where steep mountains crash into the seas, massive glacier sculpted valleys inspire awe, and unique wildlife roam the bays. It’s also has a very interesting history. Settled by the British as a penal colony, it was a major port of call for everyone from Magellan to Darwin. It has since served the world as a whaling port, then a major fishing port and now as the jumping off point for Antarctica. 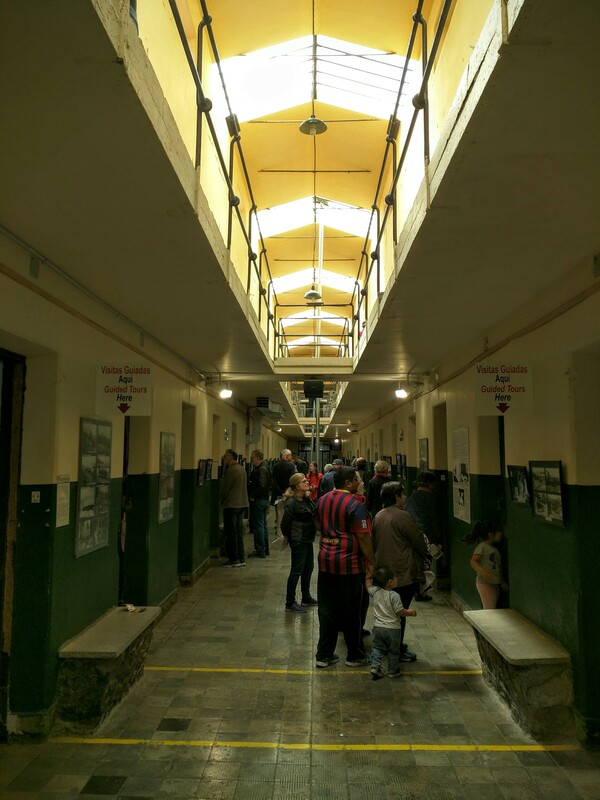 Prison cells now serve as exhibits on everything from Darwin’s expedition here to whale anatomy. 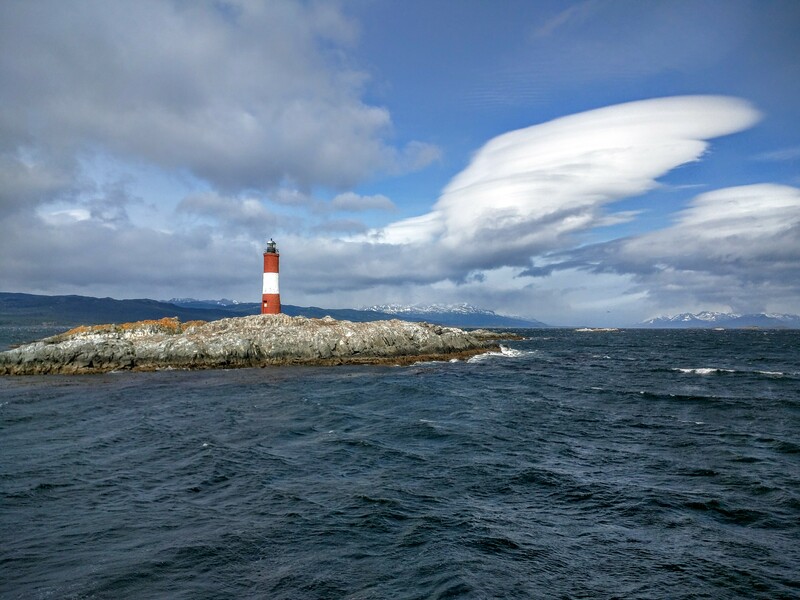 On one of our days in Ushuaia we hopped on a boat for a harbor cruise. Probably the best activity of our trip, out boat took us to see a colony of Imperial Cormorants, a group of once nearly extinct southern sea lions and a famous lighthouse that serves as a beautiful photo opportunity. The real attraction for the cruise is however to see a few of Antarctica’s most famous residents, 2 types of penguins. 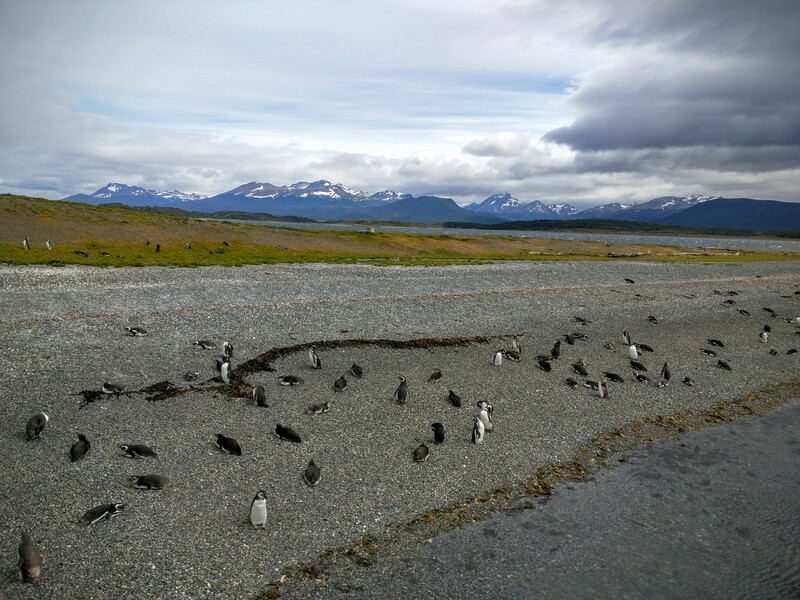 Magellanic and Gentoo penguins summer off Ushuaia. 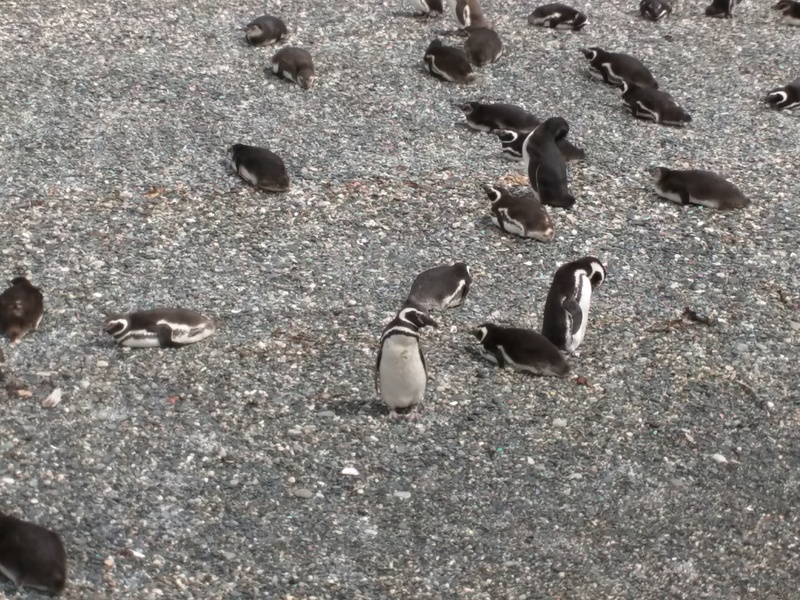 We were only able to see this group of the smaller Magellanic penguins as the Gentoo proved to be more elusive. Another great day for us was when we hiked Tierra del Fuego National Park. 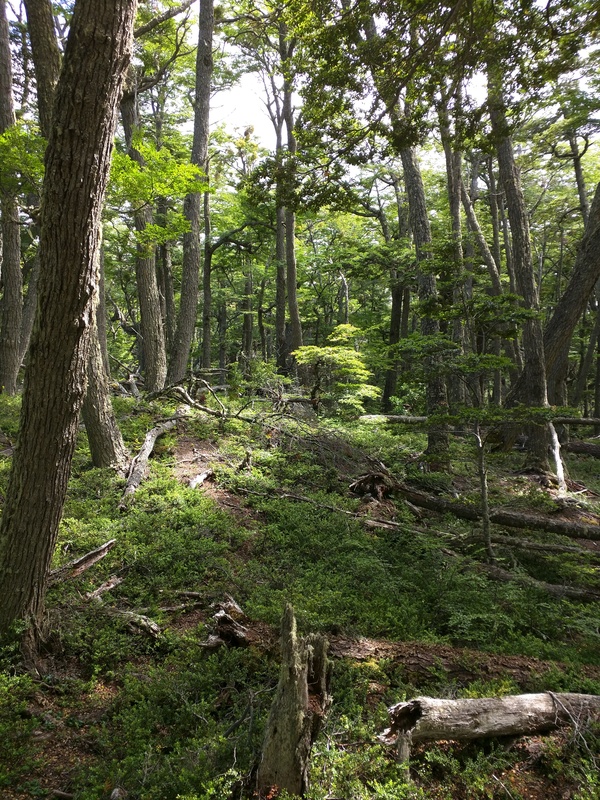 Only 10 miles from Ushuaia, Tierra del Fuego is a beautiful and well maintained park. Our hike along its incredibly windy coastline provided many beautiful photos. Being here, we’ve felt as small as anywhere we’ve been on our trip. They love their “southern-ness.” After a long hike in the park, we enjoyed a pint of the world’s southern most beer. 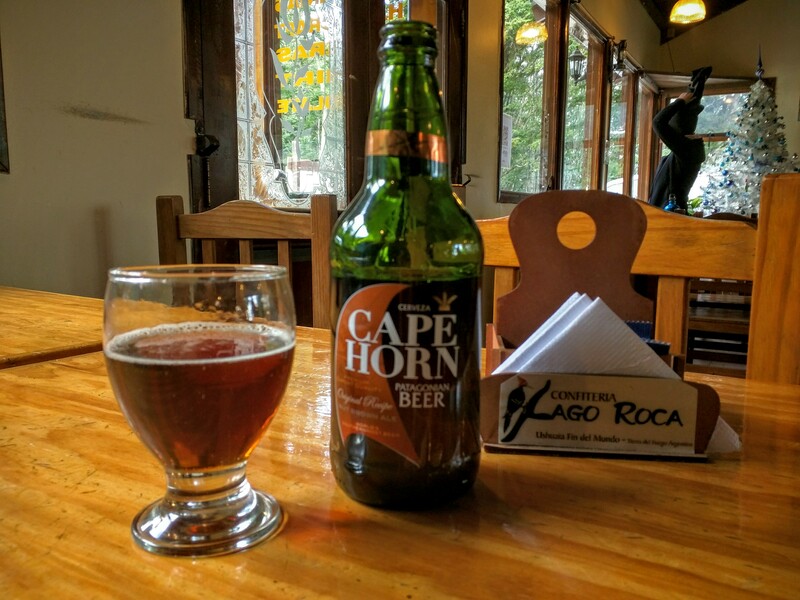 Brewed with Patagonian hops and barley. 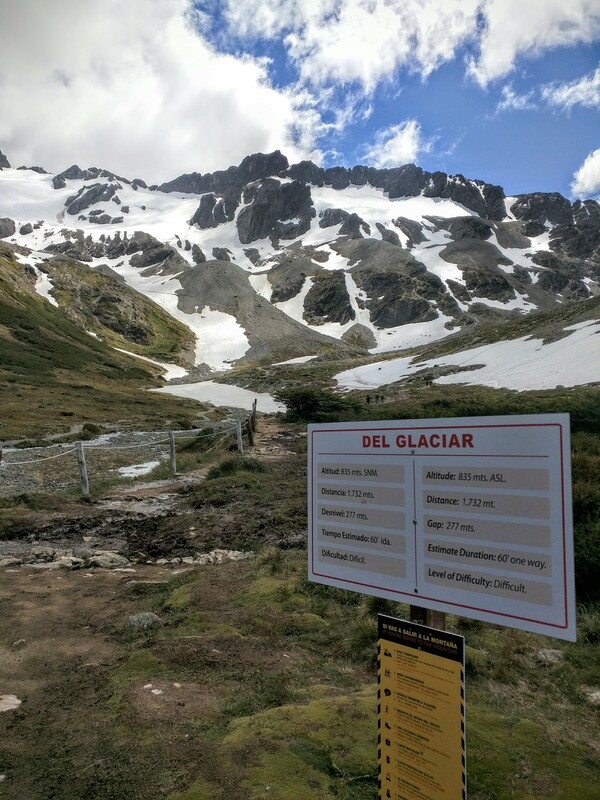 Another day, we headed just outside of the city to hike to one of the many glaciers that overlook Ushuaia. The only chairlift for this “ski resort” was broken, so an hour hike it was up to see the snow. Living in an endless summer for the last year, seeing snow was a welcomed site for Dan who loves his winters. As you know, we love our food and Ushuaia didn’t disappoint. Still a major fishing port, it one of the only places in the world where you can get fresh King Crab. After a few mediocre overpriced meals, we found Garibaldi’s Restaurant and we never looked back. We ate here 3 of our 5 nights in Ushuaia. 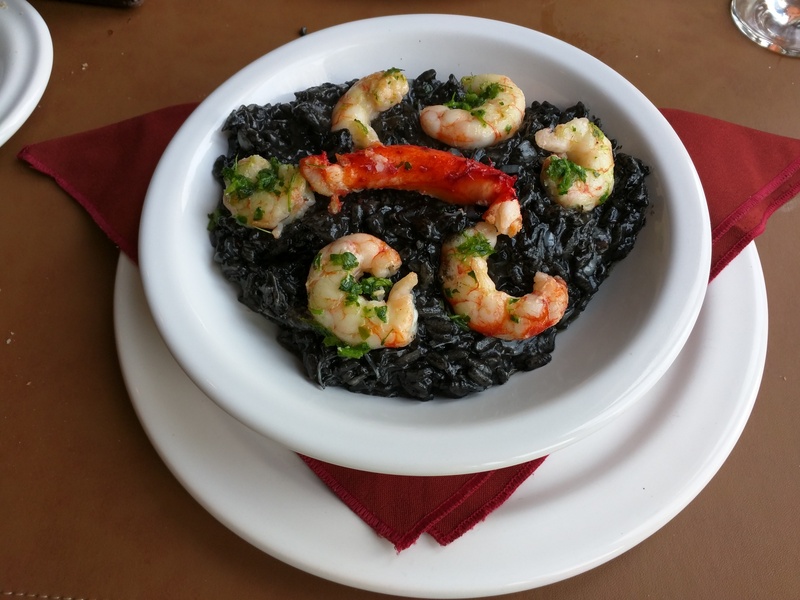 Standout dishes were a mixed seafood stew, black risotto with shrimp and king crab and king crab ceviche. This entire pile is king crab. Only in Ushuaia could you get this because ceviche requires uncooked crab.